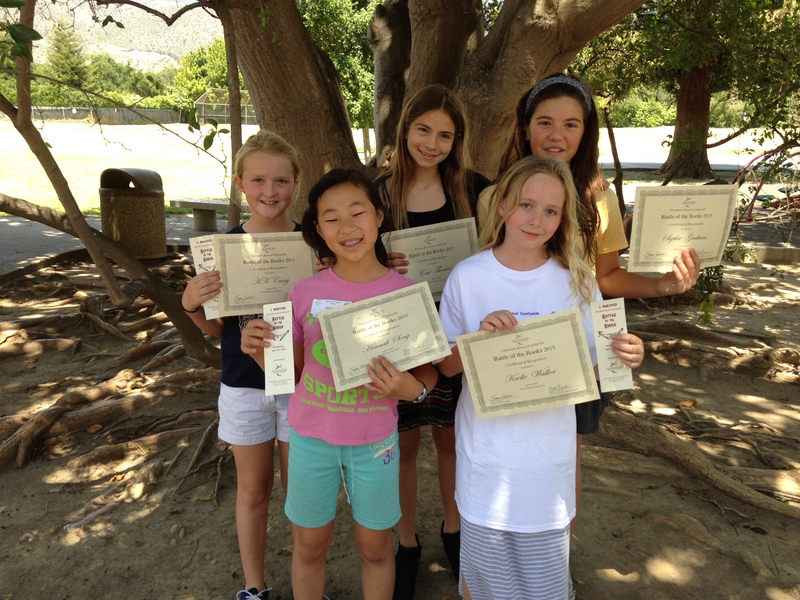 Congratulations to our Battle of the Books 2015 Team! On Wednesday, April 30, five intrepid readers in grades 4-6 made the journey to the Santa Barbara County Schools Auditorium to do battle with students from 54 schools from all around Santa Barbara County. These incredible readers have been reading from a list of 30 books and several read all 30. We started practicing in February and all their hard work paid off. One of our students made it to the finals with her team and her team was the winning team!! This is a great program to honor and encourage students to read across the genres and this year’s team from our school was one of the best ever! This will be the last post by me to Voices From the Inglenook. After 43 years as an educator, the last 26 as librarian at Cold Spring, it is time for me to retire and enjoy doing many things I have waited to do. This has been a dream career for me. I loved school as a child, loved my teachers, and above all loved books! I have been so fortunate to be able to work here at Cold Spring and I’m very happy to be leaving the library in the capable hands of our present third grade teacher, Mari Callahan. Thank you all for all your wonderful, positive comments on the blog over the past many years. I hope it has been a help to you as librarians and a source of information to parents. Even though this is the first of May and there are several weeks of school left, I have much to do to finish up my career here and train my successor so the blog is one of the things I need to complete now. Best wishes to all of you who have followed me over the years! Congratulations on your retirement! I have enjoyed your blog for many years. I have enjoyed following your blog. I hope that the new librarian will continue this and I wish you a wonderful retirement! Thank you so much! I hope she will as well. I will really miss reading your blog each week, but wish you much happiness as you begin your next exciting “chapter!” Thank you for inspiring me with your ideas – I have learned a lot from you from afar. Best of luck to you, Janet!